When I was an adolescent and the Vietnam War was in full tilt, there was a movement wherein you could purchase a metal wrist band with the name of a prisoner of war (POW) imprinted on it. The idea was to wear the band in support of that person until he was released. My serviceman’s name was Lt. Col. Louis Makowski. That’s all I knew at the time. Much later I found out he was a 16-year veteran of the United States Air Force working as a navigator when his plane was shot down over North Vietnam on October 6, 1966. He was first reported missing in action (MIA) then later reported as a POW. I remember the sadness of those days as the many numbers of the fallen were reported daily on the news. I remember the protests, the peace signs, and the unrest in our country caused by this war. I wore Lt. Col. Makowski’s wrist band for many years and prayed for him daily. I can’t even imagine the torture, physical abuse, starvation and loneliness this man suffered through. For four years there was no word about him or his whereabouts. Then in 1970, his wife began getting letters from a prison camp. He was alive and well. As the war came to a close, the Vietnamese began releasing these prisoners. Television stations would broadcast their return to the United States as they arrived at the airport and would announce their names one by one as they descended the ramp from the plane. I happened to be watching one of these broadcasts, and I couldn’t believe my eyes or my ears when they announced Lt. Col. Louis Makowski. He was released on March 4, 1973 after 6 ½ years of incarceration. When I saw him, I started crying as if I knew him. I took my bracelet off and kissed it. He was finally home safe. I still have that bracelet, and every time I look at it I am reminded of that time in our history and of the brave military who fought during the Vietnam War. We should try very hard never to forget any war –Vietnam, the World Wars, Korea, Persian Gulf or Mid-East confrontations or the details that helped us to rise above these conflicts. The independence we enjoy today is because of these courageous troops who defended our country. And despite some of our nation’s recent challenges, we still stand united as the land of the free and the home of the brave. As we celebrate our independence this week and honor those who have served us so heroically, let us always remember and never forget the price they paid for the privilege of our freedom. Even if the reminder is a small metal wrist band imprinted with the name of an unknown Air Force navigator. 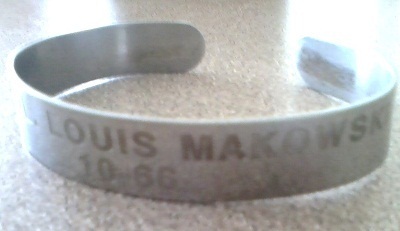 My serviceman’s name was Lt. Col. Louis Makowski. That’s all I knew at the time. Much later I found out he was a 16 year veteran of the United States Air Force working as a navigator when his plane was shot down over North Vietnam on October 6, 1966. He was first reported missing in action (MIA) then later reported as a POW. I remember the sadness of those days as the many numbers of the fallen were reported daily on the news. I remember the protests, the peace signs, and the unrest in our country caused by this war. I wore Lt. Col. Makowski’s wrist band for many years and prayed for him daily. I can’t even imagine the torture, physical abuse, starvation and loneliness this man suffered through. For four years there was no word about him or his whereabouts. Then in 1970, his wife began getting letters from the prison camp. He was alive and well. As the war came to a close, the Vietnamese began releasing these prisoners. Television stations would broadcast their return to the United States at the airport and would announce their names one by one as they descended the ramp from the plane. I happened to be watching one of these broadcasts, and I couldn’t believe my eyes or my ears when they announced Lt. Col. Louis Makowski. He was released on March 4, 1973 after 6 ½ years of incarceration. I started crying as if I knew him. I took my bracelet off and kissed it. He was finally home safe. I still have that bracelet, and every time I look at it I am reminded of that time in our history and of the brave military who fought during the Vietnam War. We should never forget any war –Vietnam, the World Wars, Korea, or the Mid-East confrontations or the details that helped us to rise above these conflicts. It is because of those who defended us that we enjoy our independence. And despite some of our nation’s recent challenges, it is still the land of the free and the home of the brave. As we honor those who have sacrificed their lives for our country on this Memorial Day, let’s never forget and always be reminded of the price these dear soldiers paid for the privilege of our freedom. Even if the reminder is a small metal wrist band imprinted with the name of an unknown Air Force navigator.